Outside of Mardi Gras (and perhaps Halloween), St. Patrick’s Day is one of the biggest parade and party days in the city -- which makes perfect sense, given how many members of the community have roots on the Emerald Isle. 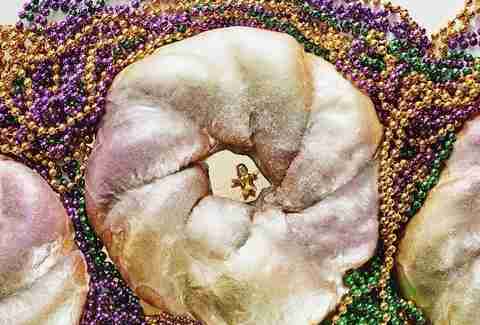 Combine that with the Big Easy’s incomparable affinity for floats, costumes, food, drink, and general tomfoolery, and you have a perfect storm of celebrations. While most of the big St. Paddy's fun takes place the weekend before, there are still plenty of good times to be had in the weekdays leading up to the holiday itself. If you’re looking to make the most out of this time-honored celebration, here’s where you’re going to want to be. Old Metairie Irish Festival Orleans Parish doesn’t get to have all the fun during the big green weekend. Jefferson wants in on the action, too. Hence, it's once again hosting the annual Irish Festival in Old Metairie, which will feature Bear's po-boys (one of the best roast beef sandwiches in the city), Porter & Luke’s, and Drago’s ubiquitously-imitated-but-never-duplicated original charbroiled oysters. Plus, the whole thing is for a good cause, so make sure you get good and sauced. It’s charity work! Old Metairie Irish Festival Old Metairie Orleans Parish doesn’t get to have all the fun during the big green weekend. Jefferson wants in on the action, too. Hence, it's once again hosting the annual Irish Festival in Old Metairie, which will feature Bear's po-boys (one of the best roast beef sandwiches in the city), Porter & Luke’s, and Drago’s ubiquitously-imitated-but-never-duplicated original charbroiled oysters. Plus, the whole thing is for a good cause, so make sure you get good and sauced. It’s charity work! Jim Monaghan’s St. Patrick’s Parade Jim Monaghan’s has been the biggest fest in the French Quarter on St. Paddy’s weekend for the past 33 years, and that’s not looking to change any time soon. This bar crawl winds through the Quarter with various bar stops, plus music by the likes of the Celtic Highlanders, Irish Zulu, and, naturally, The Bearded Oysters, among others. Jim Monaghan’s St. Patrick’s Parade French Quarter, starts at Molly's Jim Monaghan’s has been the biggest fest in the French Quarter on St. Paddy’s weekend for the past 33 years, and that’s not looking to change any time soon. This bar crawl winds through the Quarter with various bar stops, plus music by the likes of the Celtic Highlanders, Irish Zulu, and, naturally, The Bearded Oysters, among others. Irish Channel Parade This is it. The big one. The granddaddy of them all. 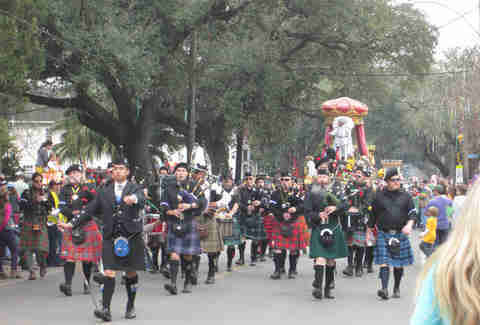 The Irish Channel Parade is probably the largest, most heavily attended, most fun parade in New Orleans. And they don’t just throw beads. Oh no -- expect riders to hurl cabbages, carrots, potatoes, and onions (all the easily tossed ingredients of a traditional Irish stew), in addition to beads, trinkets, and anything green, including pickles and -- naturally -- Irish Spring soap. Note: the parade route has changed this year, so make sure you’re aware of the new one before you claim your spot. Irish Channel Parade Irish Channel This is it. The big one. The granddaddy of them all. 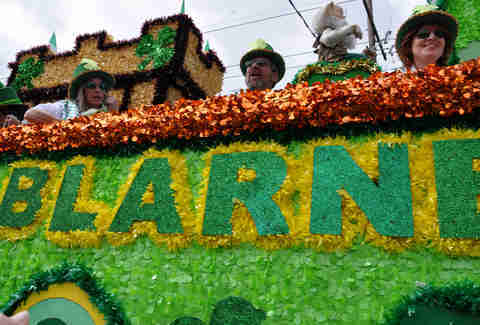 The Irish Channel Parade is probably the largest, most heavily attended, most fun parade in New Orleans. And they don’t just throw beads. 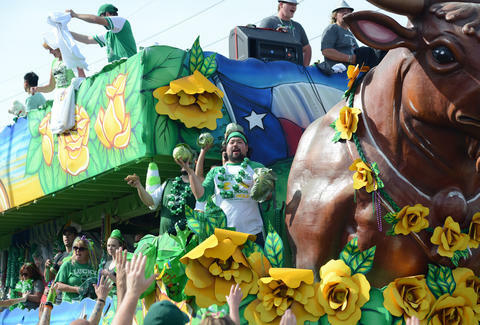 Oh no -- expect riders to hurl cabbages, carrots, potatoes, and onions (all the easily tossed ingredients of a traditional Irish stew), in addition to beads, trinkets, and anything green, including pickles and -- naturally -- Irish Spring soap. Note: the parade route has changed this year, so make sure you’re aware of the new one before you claim your spot. Shamrockin’ Run While St. Patrick’s Day doesn’t quite scream “exercise,” New Orleans does it right -- not surprisingly. This 8k fun run features a “Guinness Challenge,” which dares you to down a 4oz cup of Guinness (“for strength!”) at various points along the route. This is serious business, though: the winner takes home $500 and a case of Guinness, with prizes also going to the best four runners-up ($400 for second, $300 for third, and so on). Shamrockin’ Run Starts at CBD, ends at Audubon Park Uptown While St. Patrick’s Day doesn’t quite scream “exercise,” New Orleans does it right -- not surprisingly. This 8k fun run features a “Guinness Challenge,” which dares you to down a 4oz cup of Guinness (“for strength!”) at various points along the route. This is serious business, though: the winner takes home $500 and a case of Guinness, with prizes also going to the best four runners-up ($400 for second, $300 for third, and so on). Finn McCool’s block party Extravaganza The Crescent City’s favorite soccer bar is going all out for St. Paddy’s: they’ll open at 10am to host a party filled with Irish music, dancing, and free food (which will come out “around 3-ish,”). In addition to the standard-fare festivities, Finn McCool’s is also hosting an “Irish Olympics” which will feature events like best short story, best decorated potato, “feats of balance,” cabbage bowling, Guinness flip-cup, and, naturally, a potato-eating contest. Do you have what it takes to win? Warning: competition will be fierce (or at least fiercely tipsy). Finn McCool’s block party Extravaganza Mid-City The Crescent City’s favorite soccer bar is going all out for St. Paddy’s: they’ll open at 10am to host a party filled with Irish music, dancing, and free food (which will come out “around 3-ish,”). In addition to the standard-fare festivities, Finn McCool’s is also hosting an “Irish Olympics” which will feature events like best short story, best decorated potato, “feats of balance,” cabbage bowling, Guinness flip-cup, and, naturally, a potato-eating contest. Do you have what it takes to win? Warning: competition will be fierce (or at least fiercely tipsy). Go wild at The Irish House block party Perhaps the best true Irish pub and restaurant in New Orleans, The Irish House won't just be celebrating on the day itself. 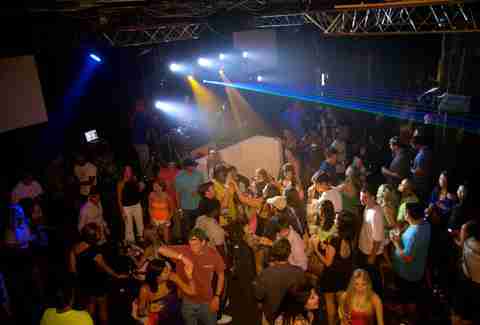 It's hosting an entire week of activities, culminating in a monstrous block party on St. Paddy's. There will, of course, be plenty of food, music, dancing, a jazz brunch, Irish school dancers, competitions -- and loads of Guinness and whiskey. 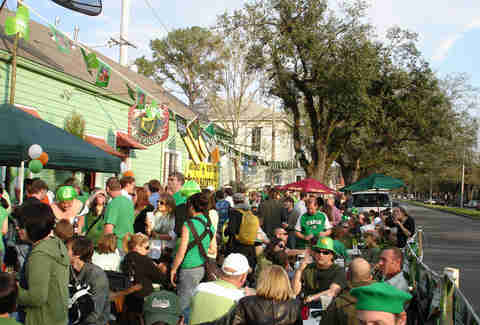 Go wild at The Irish House block party Lower Garden District Perhaps the best true Irish pub and restaurant in New Orleans, The Irish House won't just be celebrating on the day itself. 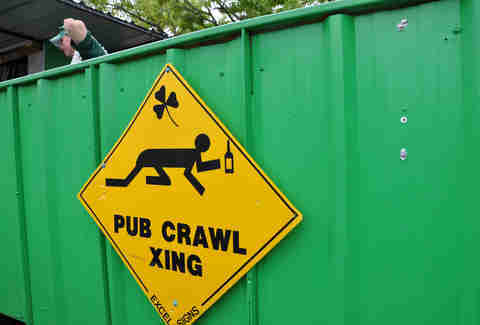 It's hosting an entire week of activities, culminating in a monstrous block party on St. Paddy's. There will, of course, be plenty of food, music, dancing, a jazz brunch, Irish school dancers, competitions -- and loads of Guinness and whiskey. St. Patrick’s Day Bash with Chapter: SOUL at Verret's Lounge If you’re looking for something different from “Danny Boy” and “When Irish Eyes Are Smilin'” on St. Paddy’s, head to this fantastic Uptown/Central City dive to celebrate the day with some kickin’ funk and soul, not to mention cheap drinks -- and plenty of action on the dance floor. St. Patrick’s Day Bash with Chapter: SOUL at Verret's Lounge Central City If you’re looking for something different from “Danny Boy” and “When Irish Eyes Are Smilin'” on St. Paddy’s, head to this fantastic Uptown/Central City dive to celebrate the day with some kickin’ funk and soul, not to mention cheap drinks -- and plenty of action on the dance floor. 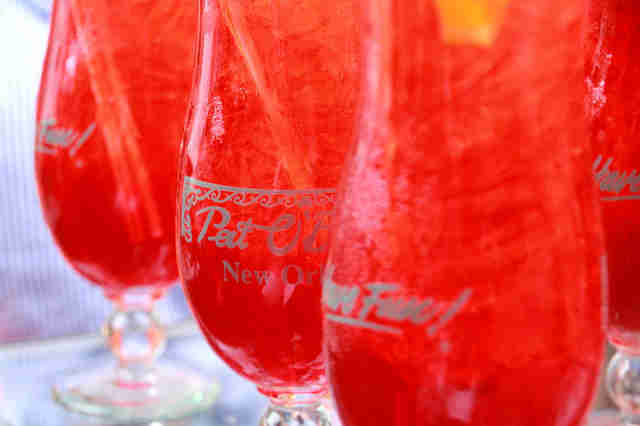 Pat O’Brien’s As its name implies, this legendary French Quarter bar was founded by an Irishman -- the inventor of New Orleans’s own hurricane cocktail, no less. It'll be celebrating Pat’s heritage in its own special way (fire fountains play a role) starting at noon. You’ll get live music from Groovy7, food specials from the kitchen, and, perhaps most importantly, $3 Fuzzy Leprechaun cocktails. How could this possibly go wrong? (Don't answer that). Pat O’Brien’s French Quarter As its name implies, this legendary French Quarter bar was founded by an Irishman -- the inventor of New Orleans’s own hurricane cocktail, no less. It'll be celebrating Pat’s heritage in its own special way (fire fountains play a role) starting at noon. You’ll get live music from Groovy7, food specials from the kitchen, and, perhaps most importantly, $3 Fuzzy Leprechaun cocktails. How could this possibly go wrong? (Don't answer that). Sucré New Orleans While this fancy sweet shop and gelato parlor isn’t having a St. Paddy’s party per se, it is offering an Irish version of its glorious king cake, which incorporates chocolate, salted caramel cream, and a whiskey glaze on buttery brioche -- shaped like a four-leaf clover. Bring one to your St. Paddy’s Day party of choice, and you’ll be heralded as a hero for sure. Sucré New Orleans Garden District, French Quarter While this fancy sweet shop and gelato parlor isn’t having a St. Paddy’s party per se, it is offering an Irish version of its glorious king cake, which incorporates chocolate, salted caramel cream, and a whiskey glaze on buttery brioche -- shaped like a four-leaf clover. Bring one to your St. Paddy’s Day party of choice, and you’ll be heralded as a hero for sure. Downtown Irish Club Parade If you’re more of a Downtown sort, and didn’t manage to get over to the Irish Channel for the parade the previous weekend, fear not -- the Irish Club has you covered. Its parade is marching from Marigny/Bywater all through the French Quarter, with stops at Bud Rip’s, Markey’s, Mimi’s, Ryan’s, and more along the way. Downtown Irish Club Parade Bywater/Marigny/French Quarter If you’re more of a Downtown sort, and didn’t manage to get over to the Irish Channel for the parade the previous weekend, fear not -- the Irish Club has you covered. Its parade is marching from Marigny/Bywater all through the French Quarter, with stops at Bud Rip’s, Markey’s, Mimi’s, Ryan’s, and more along the way. Kilts of Many Colours at the French Market It wouldn’t be St. Paddy’s without some old-fashioned kilts and bagpipes, right? This kitted-out traditional troupe will be taking its music through the streets of the French Quarter, in what some might call a Gaelic second line (only in NOLA, right? ), winding up on the upper Pontalba by Jackson Square. Kilts of Many Colours at the French Market French Quarter It wouldn’t be St. Paddy’s without some old-fashioned kilts and bagpipes, right? This kitted-out traditional troupe will be taking its music through the streets of the French Quarter, in what some might call a Gaelic second line (only in NOLA, right? ), winding up on the upper Pontalba by Jackson Square. St. Patrick’s Day Bike Night Get your motor running and your chaps on, because St. Patrick’s marks the beginning of “Bike Night” riding season on Thursday nights, for all you two-wheeled warriors. There’s also the promise of “beer and festivities,” which sounds pretty vague. But it’s a motorcycle rally, so just use your imagination. 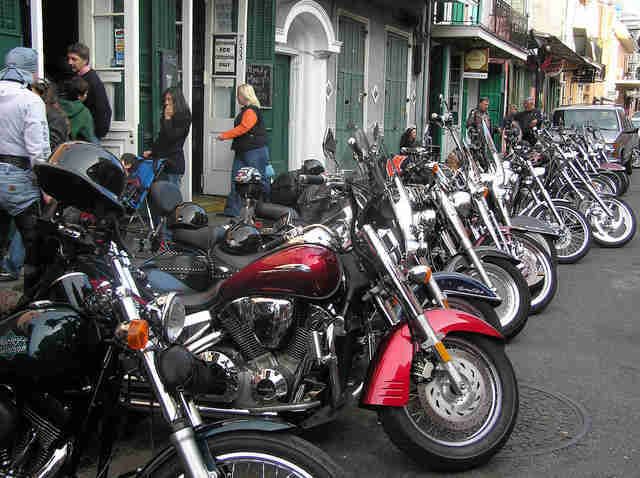 St. Patrick’s Day Bike Night Metairie Get your motor running and your chaps on, because St. Patrick’s marks the beginning of “Bike Night” riding season on Thursday nights, for all you two-wheeled warriors. There’s also the promise of “beer and festivities,” which sounds pretty vague. But it’s a motorcycle rally, so just use your imagination. Irish Channel St. Patrick's Day Block Party for St. Michael's Special School If you like to party it up on St. Paddy’s, but feel like being altruistic (in addition to being tipsy), make sure to check out this fun, family-friendly block party in the Irish Channel with food, drink, music, and Irish dancing. Irish Channel St. Patrick's Day Block Party for St. Michael's Special School Irish Channel If you like to party it up on St. Paddy’s, but feel like being altruistic (in addition to being tipsy), make sure to check out this fun, family-friendly block party in the Irish Channel with food, drink, music, and Irish dancing. St. Paddy’s Day celebration at Jax Brewery Everyone knows the best way to view a parade in New Orleans is from a balcony on the route. So should you find yourself without friends or family members with a convenient French Quarter pied-à-terre for you to borrow, don’t worry. You can always head over to Jackson Brewery and take advantage of its vantage, as well as drink specials and plenty of food. St. Paddy’s Day celebration at Jax Brewery French Quarter Everyone knows the best way to view a parade in New Orleans is from a balcony on the route. So should you find yourself without friends or family members with a convenient French Quarter pied-à-terre for you to borrow, don’t worry. You can always head over to Jackson Brewery and take advantage of its vantage, as well as drink specials and plenty of food. 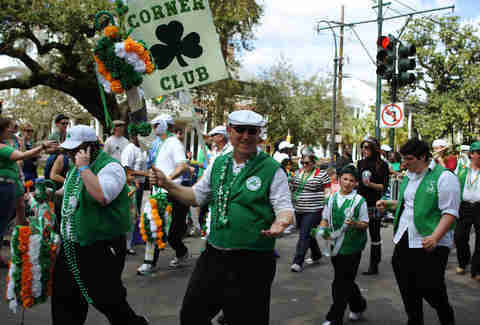 Italian American Marching Club In New Orleans, St. Paddy’s isn’t just for the Irish. Given that the holiday falls during the St. Joseph’s day festivities, Italians enjoy getting in on the party, as well, including this doozy of an event featuring Lena Prima (Louis’ daughter -- also from NOLA) and a whopping 80 dancing maids performing the tarantella in the Piazza d'Italia. Italian American Marching Club French Quarter In New Orleans, St. Paddy’s isn’t just for the Irish. Given that the holiday falls during the St. Joseph’s day festivities, Italians enjoy getting in on the party, as well, including this doozy of an event featuring Lena Prima (Louis’ daughter -- also from NOLA) and a whopping 80 dancing maids performing the tarantella in the Piazza d'Italia.